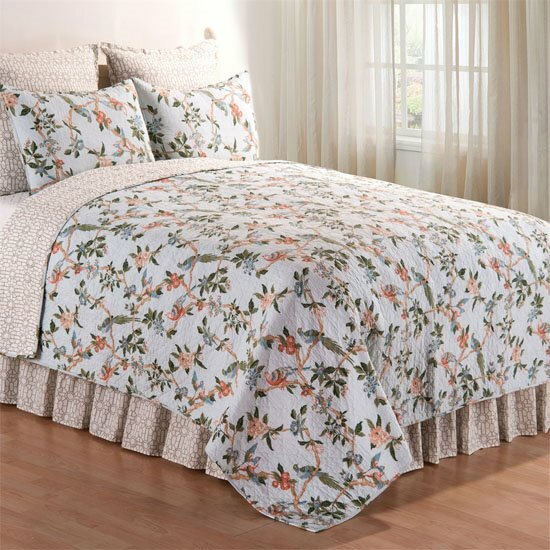 Marianne Quilt Bedding by C & F Enterprises - PC Fallon Co.
Lowest prices all the time, guaranteed! If you find a better price, let us know. Marianne Quilt bedding by C & F Enterprises displays elegant birds perched on limbs among beautiful flowers and leaves against a pale blue background. This classic and lovely licensed Williamsburg pattern is done in greens, blues, tans, terra cotta, and brick. The charming birds and flowers create a welcoming garden setting in your home. Self binding trim at edges. The quilt reverses to a garden trellis pattern in grey and tan on cream. To add to the fresh outdoor theme, a euro sham and bedskirt are offered in the garden trellis design. A valance carries the floral pattern to your windows. 100% cotton and machine washable on gentle. Marianne Full Queen Quilt displays lovely fantasy multi-color birds perched on limbs among beautiful flowers and leaves against a pale blue background. Colors include greens, blues, tans, terra cotta, and brick. Williamsburg pattern. Self binding trim at edges. Cotton filled, prewashed. Luxury Oversized. 90"W x 92"L. Fits full and queen size beds. Reverses to a garden lattice print in grey and tan on a cream background. We offer the complete ensemble in the Marianne pattern. Manufacturer's UPS code is 008246502807. Marianne King Quilt displays lovely fantasy multi-color birds perched on limbs among beautiful flowers and leaves against a pale blue background. Colors include greens, blues, tans, terra cotta, and brick. Williamsburg pattern. Self binding trim at edges. Cotton filled, prewashed. Luxury Oversized. 108"W x 92"L. Reverses to a garden lattice print in grey and tan on a cream background. We offer the complete ensemble in the Marianne pattern. Manufacturer's UPS code is 008246502784. Marianne Standard Sham displays lovely fantasy multi-color birds perched on limbs among beautiful flowers and leaves against a pale blue background. Colors include greens, blues, tans, terra cotta, and brick. The back of the sham is done in the same pattern, but not quilted. Williamsburg pattern. 20"H x 26"W. We offer the complete ensemble in the Marianne pattern. Manufacturer's UPS code is 008246502791. The Basketweave Spa Euro Sham Set of 2 is quilted in a textured basketweave design in a soft blue green tone. 26"H x 26"L. Designed to be used behind a standard sham. Williamsburg design. Manufacturer's ID number is 008246334309. Design reminiscent of fretwork on gazebos, porch railings and garden gates on a gathered, split corner, 18" drop bedskirt. 78" x 80". Williamsburg design. We offer the complete ensemble in the Garden Folly pattern by C & F.
Marianne Valance displays lovely fantasy multi-color birds perched on limbs among beautiful flowers and leaves against a pale blue background. Colors include greens, blues, tans, terra cotta, and brick. Williamsburg pattern. Straight rod pocket valance. 15.5"H x 72"W. Unlined. We offer the complete ensemble in the Marianne pattern. Manufacturer's UPS code is 008246503538.